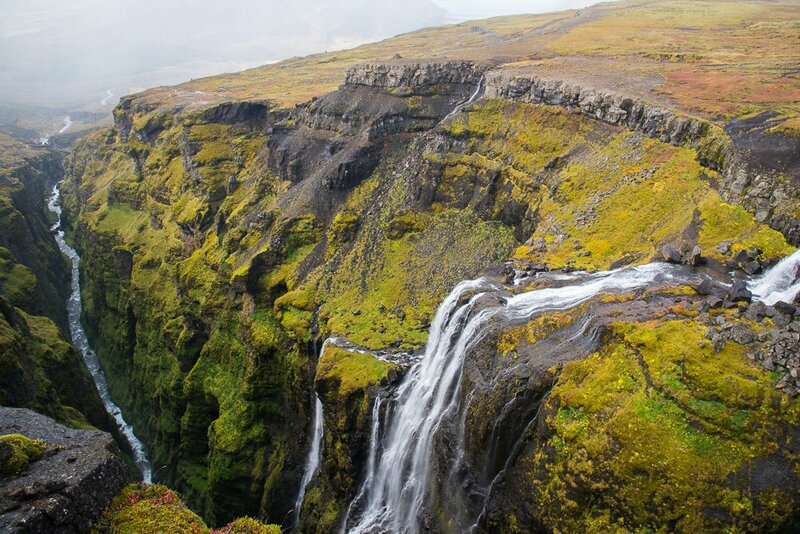 Iceland is home to many incredible waterfalls, with several just off the main tourist roads. While this makes for easy access, it also means lots of people crowding around all trying to take the same photo. With a little extra time, you can leave the crowds behind and hit the trail to explore some of Iceland’s hidden wonders on your own. Iceland’s tallest waterfall (198m) remains hidden in a narrow canyon about 1 hour northeast of Reykjavik. Follow the dirt road to the parking lot where you will begin the 5.5km out and back hike with some of the best views anywhere in the region. The trail crosses into a lava cave, through a river (over cables for support), and up along a mossy narrow canyon. There are a few steep/slippery sections where you’ll find a rope for support. Enjoy the incredible views back towards Hvalfjordur, one of the prettiest fjords. Once you reach the top of the falls, you have the option to wade across the river (go further upstream where it’s a bit calmer) or continue up to Hvalfell summit to increase the hike to a 10km loop. Skogafoss at the beginning of "waterfall way"
Skogafoss is one of the largest waterfalls in Iceland (25m wide, 60m tall) and also one of the most popular. You can reach the base by a short detour from Route 1 where you can park within eyeshot of the misty falls. But don’t just snap some pictures and drive on to the next place, spend some time climbing the stairs to the left of the falls where you can reach the top for a different perspective. Leave the crowds behind by hiking the beginning of the Fimmvörðuháls Trail along the eastern bank of Skógá river. Here you will pass another 26 waterfalls (give or take) along “waterfall way”, the first section of the 25km trail to Thórsmörk. From the northern side of Seydisfjordur (East Fjords) follow the trail towards Vestdalsvatn Lake, about 2-3 hours away. Every 10-15 minute you will pass a new waterfall or section of cascades as you climb up out of the fjord, plateau by plateau. The trail switches between flat hiking to a short climb every 5-10 minutes as you gain elevation in alternating chunks. Hike to as many waterfalls as you like, or continue all the way to the lake at the top. Looking back on the fjord you will have incredible views of the river, meadows, valley and mountains in the distance over the fjord below. Most tourists drive to Dettifoss and hike the short loop connecting Dettifoss (Europe’s most powerful waterfall) and Selfoss (also very impressive). 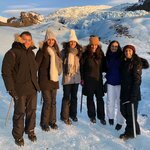 Take your time and ditch the crowds for an extended hike that covers Hafragilsfoss, Dettifoss, and Selfoss (12 km each direction). If you’re limited on time but still want a longer hike, consider a9km loop starting near Hafragilsfoss parking lot towards the Hafragil lowlands area, some of the most dramatic landscapes of the Jökulsárgljúfur area. Svartifoss (“Black falls”) is named after the dark basalt columns on either side, framing the narrow falls. From the visitor center at Skaftafell hike about 3km out and back, up the ridge and back down to the river at the base of the falls. Enjoy the views back towards the coast from your high vantage point on the hike back. If you’re looking for more exercise, extend the loop by joining one of the many other trails in the area. Take a short detour inland from Route 1 near Egilsstaðir and you’ll find a nice hike to Hengifoss (“Hanging Falls”), Iceland’s third highest waterfall (128m). Halfway along the 2.5km trail (each way, 5km total) you will find Litlanesfoss (also called Stuðlabergsfoss, or “Basalt Column Falls”) as well. Look closely for the layers of red clay in between the basalt columns surrounding the falls.